Mercedes-Benz Vans has unveiled the third-generation Sprinter. While this all-new model looks very similar to its predecessor, beneath the skin there are some significant changes. Thanks to an almost bewildering array of body styles, body lengths, roof heights, wheelbases, powertrains, payloads and seating arrangements, customers have to decipher more than 1,700 different specification combinations. 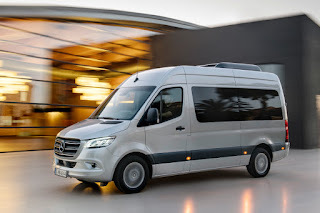 As before, there will be rear- and all-wheel drive versions of the Sprinter. 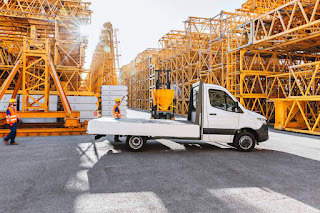 For those platforms, gross vehicle weights of up to 5.5 tonnes (12,125 lbs) are possible and maximum towing capacity is 3.5 tonnes (7,716 lbs). However, front-wheel drive is often preferable for certain applications, hence Mercedes-Benz’s decision to offer it as well. 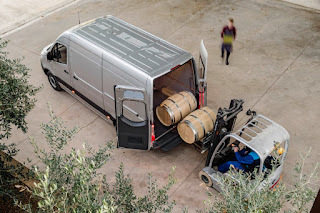 Key advantages are an extra 50 kg (110 lbs) of payload (compared to the equivalent rear-wheel drive van), a floor that’s lower by 80 mm (3.1”) and increased cargo space. GVWs are 3.0, 3.5 or 4.1 tonnes (6,614, 7,716 or 9,039 lbs). Currently, the Fiat Ducato is the most popular basis for large camper van conversions and coachbuilt motorhomes. 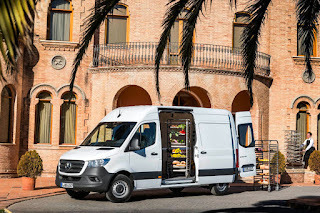 Mercedes-Benz reckons the aforementioned front-wheel drive Sprinter is in a strong position to challenge the Italian’s dominance in this sector. One key selling point is an interface module that digitally integrates vehicle and habitation functions, resulting in a more convenient experience. For example, heating and hot water settings could be adjusted via the dashboard infotainment screen or a dedicated app, rather than a separate dedicated control panel. Other alterations enhance the Sprinter’s suitability, too. 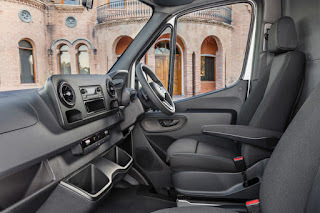 For instance, access rearwards from the cab is now much better because an electric handbrake is fitted, so a traditional lever between the seats isn’t required. A further innovation is Hibernation Mode, which minimises current draw from the battery during lay-up periods. 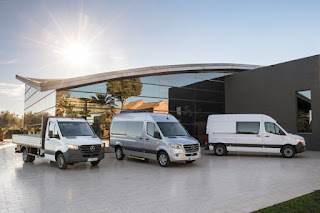 Unlike any competitor vans, the Sprinter can be powered by a six-cylinder common-rail diesel engine. Although its 187 bhp (140 kW / 190 PS) might not seem very impressive, the real headline figure is 440 Nm (325 lb/ft) of peak torque that arrives between 1,600 and 2,600 rpm. Opting for rear- or all-wheel drive means the smaller 2.1 litre unit comes with 112 bhp (84 kW / 114 PS), 141 bhp (105 kW / 143 PS) or 160 bhp (120 kW / 163 PS). If a manual gearbox doesn’t appeal, then a 7G-Tronic Plus automatic transmission is the alternative. Front-wheel drive customers get to pick an output of either 112 bhp or 141 bhp, although anybody purchasing a camper van or motorhome can upgrade to 174 bhp (130 kW / 177 PS) instead. The transmission line-up comprises a six-speed manual and a nine-speed automatic. As would be expected, a gasoline motor (of unknown capacity at this stage) is being readied for the USA and Canada. It’ll be paired with a nine-speed automatic transmission. Restrictions on diesel-fuelled vehicles in city centres are becoming increasingly punitive. Recognising the risks to urban deliveries, Mercedes-Benz has confirmed that the electric-powered eSprinter is going to join the range sometime during 2019. Important details such as range and recharge times have yet to be disclosed, though. Mercedes PRO is a web-based fleet management tool consisting of eight modules. They cover aspects such as van usage, maintenance scheduling, dynamic route guidance, messaging and driver hours logging. In-cab access to Mercedes PRO is via the MBUX (Mercedes-Benz User Experience) multimedia system. It can be interfaced using steering wheel buttons, voice commands or a 10.25” HD touchscreen. Some of the optional features devised for the Sprinter provide a degree of autonomy. Active Brake Assist and Active Lane Keeping Assist are fairly self-explanatory, while Distronic is radar-based adaptive cruise control that maintains a safe following distance. Among the other assistance gadgets are Attention Assist, Blind Spot Assist, Traffic Sign Assist and a Parking Package with 360° camera coverage. In Germany, Sprinter manufacturing starts next month at the Düsseldorf and Ludwigsfelde plants. South American markets are to be supplied by the González Catán factory in Argentina. For North America, the North Charleston site in South Carolina has been promoted from kit assembly to full production facility. Its first vans will be built during the second half of this year. Market launches across Europe are scheduled to begin this June.